A small Bodega coffee, a bagel with scallion cream cheese, and a leftover pizza slice. This may sound like the delicious lunch of a New Yorker, but we often forget that our everyday treasures are lined with what we consider trash. Pizza boxes, coffee cups, and bagel bags all share the merciless future of making it to their new home of a trashcan. After you and your garbage part ways, it seems as though the story ends. However, this is where the story begins with the perplexing, complex and pressing issue of what to do with the everyday waste of New York City. On average, each New Yorker generates about 15 pounds of waste each week at home, adding up to around 3 million tons of waste citywide each year. Where does all of this trash go, and how can we address the problem? For 53 years, a majority of New York City’s waste was being directed to Fresh Kills Landfill, which at the peak of operation accepted 29,000 tons a day. From 1991 until its closing in 2001, the landfill received all of NYC’s household garbage. Now, nearing twenty years after the closure of Fresh Kills Landfill, things seem brighter: the site is being reworked into a public park and a place for research and art. As the city becomes more invested to the goal of living lightly and reducing waste, New Yorkers are recycling more and putting less material on the curb, even as population numbers rise. But the city still relies on landfills for much of its waste management. Fresh Kills was the last landfill in New York City, so when the landfill closed the City of New York needed a new waste management plan. These days, the discarded takeout containers, candy wrappers, and cereal boxes of New York are sent to a sorting and processing plants called transfer stations. After that, the trash is exported to other landfills in South Carolina, Pennsylvania, and Upstate New York. 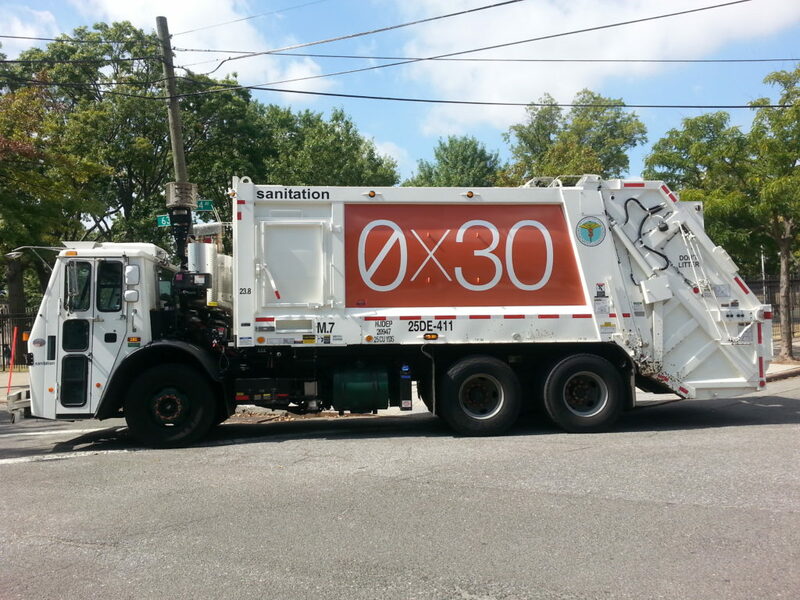 However, NYC’s goal is to put a stop to that through its 0X30 initiative. The City aims to end the need to send waste to out-of-state landfills, thus minimizing the overall environmental impact of the city’s trash, by reducing the amount of waste disposed of by 90% by 2030 from a 2005 baseline. What are New Yorkers Throwing Out? According to a 2017 Waste Characterization Study from the New York City Department of Sanitation: “Organics account for the largest part of DSNY’s residential material stream at 34%. Curbside recyclables account for another 34%, followed by 9% of other ‘divertible’ material such as textiles, plastic shopping bags, electronic waste and household hazardous waste.” This means that 77% of the NYC waste stream could be diverted from landfills, which would mark a landmark achievement for a city of nearly 9 million people. However, becoming a Zero Waste City is not something that happens overnight. According to the same 2017 Waste Reduction Study, DSNY collected 3.1 million tons of residential material last year, and 2.5 million tons (roughly 71%) of that ended up being disposed in landfills or waste-to-energy facilities. Those totals present a decline in disposal, especially when factoring in how the city’s population grew from 8.2 million to 8.5 million since the last study, but also show how work is to be done in reaching the goal of “zero waste” twelve years from now. DSNY is gradually employing sustainable strategies to reach their goal over the course of many years. For example, curbside organics collection, which is still being expanded throughout the city, now serves about 3.5 million NYC residents, and will going directly to a composting center to be used for soils and organic gardening, as opposed to a landfill of any sort. Clothing recycling initiatives – such as DonateNYC and RefashionNYC, in conjunction with DSNY’s education programs has been immensely helpful in reducing clothing going in the trash. With the help of electronic waste pick-up and drop-off services and scheduled SAFE disposal events, more than 15 million pounds of electronic waste is being diverted for recycling. Parsing through what all of this means for future policy decision will take time. But as we build towards a more sustainable city, we are reminded of the legacy of human impact by exploring and learning from a developing Freshkills Park.